From deep frying a turkey to cooking up some crawfish, a propane burner is simply a must have piece of outdoor equipment. They are easy to use, quick to setup and last a lifetime. After researching and testing a ton of different gas burners we’ve determined the Bayou Classic SP10 High-Pressure Outdoor Gas Cooker is simply the best out there. It’s made from a durable one-piece steel body, has a high quality braided stainless-steel hose and includes a stellar built in windscreen. Plus, it’s perfect for large pots with its extremely stable base. If you’re hunting for an all-around winner, this is the one for you. 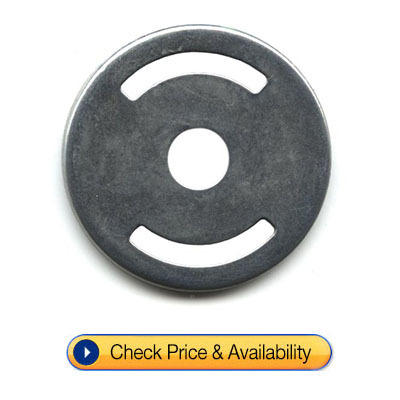 Use the quick navigation section below to skip to our complete review of this propane burner. Why get a Propane Burner? There are however, other propane burners out there. Each having their own features and designs. We’ve put together the below table so you can quickly compare our other top choices side by side. While they didn’t quite make the top spot on our list, the Edelmetall Brü Burner and the Gas One Propane Gas Cooker both deserve honorable mentions. They are each incredibly high quality units and are equally as good, or in the case of the Bru Burner, better than our top choice, albeit a bit more expensive. If you’re planning on entertaining and cooking, the Edelmetall Brü Burner is definitely worth a look. This stunning propane burner is made from extremely durable stainless steel and has a beautiful copper exterior with high quality brass components. It also comes standard with fully adjustable pot holders. No need to worry about your pot sliding off or not fitting just right. While it does lack the stainless-steel hose of the SP10, the Edelmetall Brü Burner is able to put out a ton of heat, even more than the SP10. Plus, it’s four legs give it extra stability and have optional extensions for a more ergonomic design. This is an extra heavy-duty cast iron burner made with a durable steel frame. To put it simply, the Gas One Propane Gas Cooker is built to last. Even better, it puts out a massive 200,000 BTU’s of heat. For a propane burner, this is one of the hottest we’ve ever seen. The high heat is perfect for cooking and is able to heat up oil extremely quickly. This cast iron burner comes with a rubber propane hose and built in regulator for fast and simple setup. Furthermore, it boasts a 15” diameter cooking surface for enhanced stability and superior strength. If you’re looking to cook hot and fast, this is the propane burner to get. If you looking for the best propane burner on the market, the Bayou Classic SP10 is the easy choice. This is an extremely high quality high-pressure outdoor gas cooker and is perfect for fried turkeys, crawfish boils and more. Bayou Classic is the most well-known name brand of gas burners and for good reason. It’s made from only the highest quality components and is extremely easy to assemble. Plus, due to its unique tri-leg design, the burner is surprisingly stable and able to hold even the largest of stock pots with ease. The Bayou Classic SP10 has one of the most durable designs we’ve ever seen in a propane burner. It’s made from solid heavy gauge steel and has a rock solid 1-piece welded frame. This gives it enhanced strength and superior reliability. Even better, it has high quality brass connections that can last for years of heavy use. The steel is covered in a high temperature paint to prevent corrosion and help increase the unit’s overall longevity. We did notice the coating around the burner melted off after the first use, but that is to be expected with such high temperatures and occurs in every burner we tested. The included 48” propane hose is made from superior braided stainless steel that is both flexible and strong. We much prefer stainless steel to the traditional rubber hoses. It is resistant to cracking, rust and can hold up to much harsher conditions. 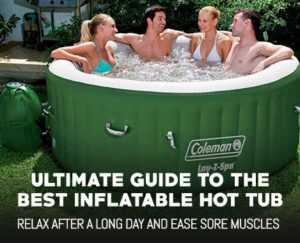 Furthermore, you don’t have to worry about the hose melting due to the heat of the burner. Aside from cost, there is no reason to ever use a stainless-steel hose. 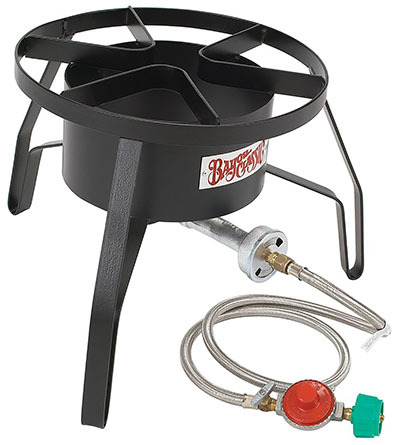 This propane burner has an ultra-wide 14” diameter cooking surface making it ideal for 30+ quart stock pots. The large area makes it super stable and give you a safe working environment. The top it off, the Bayou Classic SP10 is lifted 13” off the ground which makes for a great low-profile build. This helps to decrease the chances of it tipping and reduces stress on the legs. When it comes to super-hot oil and flames, you’ll want your unit as close to the ground as possible. There is no sense in taking a gamble when you just want to enjoy some good food with friends. The three legs extend a total of 9” from the center of the unit. The complete 18” spread, combined with the low-profile design makes this one of, if the not the most, stable propane burners on the market. Weight wise the SP10 gas burner comes in at a little over 15 pounds. We like our burners to be a bit on the heavier side, like the SP10, as it shows they have good structural stability and durability. Plus, in general, heavier units are made from higher quality steel and metal components. If it’s too light you’ll most likely have a fairly flimsy burner on your hands. With a massive 60,000 BTUs of heat output the Bayou Classic SP10 Propane Burner is an incredible addition to your backyard cooking arsenal. 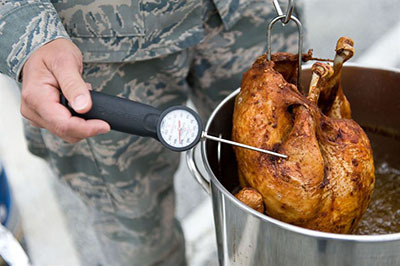 We tested the unit with a large 32-quart stainless steel turkey fryer, filled to the max with cooking oil. Even in cold weather with a bit of wind we were able to get the oil up to 350 degrees in just 24 minutes! That just goes to show you how much power this unit can provide. We also love the built-in windscreen around the burner. It did a great job of protecting the flame from the wind and only the largest of gusts would be able to blow it out. Other models skip this feature and tend to be a lot more finicky about being exposed to the elements while cooking. We do recommend that in heavy winds you turn the flame down a bit though, as it makes it a lot less likely to be blown out. Another great feature is the open design. This configuration means that any oil jumping out won’t go into the burner, but will instead fall straight down. 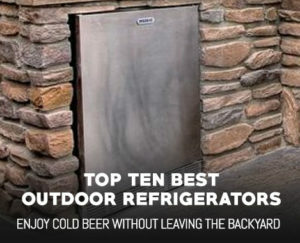 In general, this’ll lead to a lot less cleanup and will help keep your propane burner looking like new. Plus, this type of design makes maintenance and assembly a breeze. We’ve included the video below to show you just how easy it is to put together the Bayou Classic SP-10. Skip a few seconds in to get to the actual assembly. When it comes to the other components we were equally as impressed with every single one. The built-in gas regulator made adjusting the flame height and temperature a breeze. Meanwhile the included air regulator was spring mounted and extremely simple to use. Just twist it one way or the other to adjust the airflow and help to regulate the temperature. If your boiling up some wort and need precise temperature adjustment, the SP10 is the perfect tool for the job. Whether you’re a homebrewer using this to boil up your next batch of beer, or planning a festive crab boil, the Bayou Classic SP10 won’t disappoint. It’s one of the strongest, most reliable and easy to use propane burners around. We loved the high-quality materials and extremely stable design. Add onto that the easy to find replacement parts, simple assembly and maintenance free design and you have the best propane burner on the market, bar none. If you need something that’ll work year after year and don’t have time to fuss with a complex burner, just go ahead and buy the Bayou Classic SP10 now, you won’t regret it. This review also holds true for the Bayou Classic SQ14. The only difference being the square cooking surface and the lack of a wind screen. For the price we’d always go with the Bayou Classic SP10 instead, as the SQ14 offers no advantages from what we can tell. 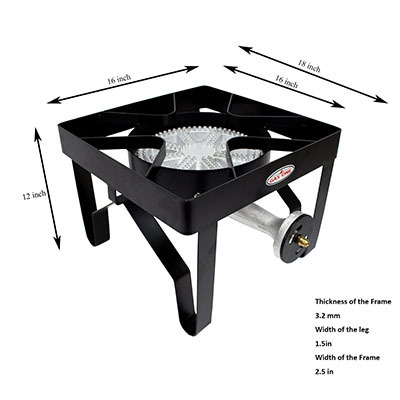 This propane burner is the ultimate in style, versatility, and performance. With a host of unique features, a beautiful copper exterior and custom designed for high efficiency use, the Edelmetall Bru Burner is perfect for home brewing, frying turkeys and more. The brushed stainless-steel components provide excellent contrast to the copper and are totally resistant to rust and the elements. Meanwhile, the adjustable cooking surface and optional leg extension make this a total winner. If you want something with a bit more style, features and power than the Bayou Classic SP10, this is absolutely the right choice. All we can say is wow. The Edelmetall Brü Burner Outdoor Propane Burner is the highest quality propane burner we’ve ever reviewed and that includes the SP10. With a luxury copper exterior, superior stainless-steel body and functional brass fittings, it has everything you could ever want in a gas burner. The build quality overall is totally top notch and speaks volumes about the care and dedication it took to create such a unit. Even details such as the incredible needle valve were not left out. You can easily tune the Edelmetall Bru Burner to just the right temperature for your wort, turkey or crawfish. Plus, you know that the quality components will keep working for year after year with little to no maintenance. In general, this is a rock-solid unit that performs extremely well and is suited for just about any task. If we had to use one word to describe this unit, aside from high quality, it’d be adjustable. We hate having pots that are too big or too small for our propane burners. The Edelmetall Bru Burner solves this by have completely adjustable kettle stays. The arms can be extended to a maximum of 19” in diameter and are perfect for holding even massive 30-gallon pots. Weight wise, the unit comes in at just under 30 pounds. This makes it light enough to easily move around, yet heavy enough to maintain stability while cooking. We always like a bit of weight to our units as the increased stability is well worth extra pounds. The Bru Burner measures 12” from the bottom of the legs to the top of the cooking surface, making it ideal for large tall pots and for keeping a low profile. However, if your brewing in a garage or brew cave, you can buy the Edelmetall Brü Burner Leg Extensions. These jack up the unit to a very ergonomic 27” which is perfect for not having to bend over. Be sure to grab the stainless steel brewing spoon as well for the complete brewing set. Elegant, powerful and downright perfect was our first thought upon unboxing this unit. It truly is an incredible propane burner. From the ultra high quality precision adjustment needle valve, to the corrosion resistant stainless steel body, this is a work of art. We love the pot arm adjustment positions as it’s great to have a pot fit perfectly on top of the burner. You don’t have to worry about it falling over or tilting this way and that as the wind blows. Even better, the 75,000 BTUs of heat is superior to that of the SP10 and can bring water to a boil in next to no time. Plus, we found it very easy to light and adjust. That is just one less hassle we have to worry about. Add onto that the stunning copper leg extensions and you have a powerhouse on your hands. The unit comes with a superior rubber propane hose and built in regulator, so you’ll have everything you need to be burn ready. While we would have preferred a braided metal propane hose, the included one is actually quite nice and seems to be made of durable rubber. It also ships with a stainless-steel air regulator plate. Using the plate in conjunction with the needle valve gives you extremely precise flame adjustment, perfect for a beer brewing burner or a crawfish cooker. This is a freaking incredible burner. The only reason it didn’t make number one on our list was the price. This is certainly a premium unit and has the price tag to show for it. Most people would prefer a more mid ranged unit like the Bayou Classic SP10. However, if you’re looking for the absolute best, and are willing to pay for it, Buy the Edelmetall Brü Burner Outdoor Propane Burner and throw down the gauntlet on all inferior burners. Next up on our list is the equally as impressive Gas One Propane Gas Cooker. This 200,00 BTU monster can unleash the heat and is perfect for large boils. As a direct competitor to the Bayou Classic SP10, it has a lot of the same features, but a few that differential it as well. From the massive cast iron burner to the easy to use design, this is an excellent propane burner. Plus, it includes everything you need (except the propane tank and pot) right out of the box so you’ll be ready to burn in no time. Similar to our other top choices, the Gas One Single Burner body is made from extremely thick steel. This means it has great heat resistant properties, solid welds and based on our tests, is built to last. The cast iron burner is huge and even more durable than the body. We love the heavy-duty design as well as the extra nozzles for those bright blue flames. Furthermore, the brass connections for the propane hose were high quality and sealed wonderfully. We are not a fan of steel connections and were pleased to see this didn’t have any. One area where we did feel the Gas One Burner fell short was with the propane hose. With such an expensive unit we had hoped for a braided stainless-steel hose. However, it only came with the typical rubber variety. While this isn’t a deal breaker by any means, it does mean that you’ll have to be careful about getting it to close to the flames and keeping it out of direct sunlight. The good news is that you can replace it with little trouble. If you’re interested in doing so, scroll down to our replacement parts section and pick up one of the SP10 braided hoses. Dimensionally the Gas One 200,000 BTU propane burner was a bit superior to the Bayou Classic SP10. With an awesome 16” diameter cooking surface we could balance even the largest of pots with ease and had space to spare. When you’re trying to cook using a large turkey fryer or stock pot, you’ll want as much space as possible for easy positioning and increased safety. We were also impressed with the very low-profile design. Standing at just 12” tall it was extremely close to the ground which is great for preventing your pots from tipping over. The low profile helps to lower the weight distribution and reduces the chance that a gust of wind can catch your pot at just the right angle to ruin you day. The Gas One Burner is also very portable. It only weighs 27 pounds which is perfect for taking to cookouts or quickly setting it up in your backyard. Some of the heavier units can be a pain in the rear to move, but thankfully this isn’t one of them. With its large 16” surface area and 200,000 BTU’s of available heat this thing is a true monster. You can easily fit a 100-quart pot on top of it and its rock steady. Just to give you an example, boiling a 6.5-gallon pot of 160-degree wort took less than 10 minutes thanks to the large burner. Plus, the hot flames are perfect for large pots of paella or a delicious stir fry. The high heat allows for quick cooking and easy success. As we mentioned above this Gas One propane burner is extremely study. The mild steel body is perfect for putting on the grass, patio or at a local camp site. Meanwhile the simplistic design means you can have it up and running in as little as 5 minutes. The open design is very similar to the SP10 gas burner and as such, is equally as easy to clean. Most of the oil and debris will fall directly to the floor, this’ll keep your burner looking like new. We were also impressed with the built-in regulator as it has a solid seal with the internal o-ring and was leak free. Plus, the easy to use hand tightener system is perfect for a portable propane burner and didn’t require any special tools. Combined with the air regulator plate it is super easy to get a bright blue flame that’ll heat up your water or oil in next to no time. Overall if you’re looking to boil some water and do it in a hurry, this is the propane burner to get. It has an absurdly large heat output, extremely stable design and an excellent cast iron burner. While the quality of the connections and propane hose are a bit less than the Bayou Classic SP10, the Gas One Burner still makes for an excellent choice. We love the low-profile design and enhanced stability for a bit of extra safety. If a high heat propane burner is what you’re after, go ahead and buy the Gas One 200,000 BTU Single Burner Propane Gas Cooker. If you’re in the market for the most rugged propane burner on the market, the Basecamp Single Burner Angle Iron Camping Stove is built like a tank. Made for extremely heavy duty cast iron angle bar, it can withstand years of heavy use, transport and rough conditions. It’s perfect for making up some breakfast in the backyard or having a full-on seafood boil down at the beach. We love the solid design and minimalist features. Sometimes, as with this propane burner, having less features just means less that can go wrong. The entire unit is made from ultra high quality cast angle iron with solid welds and sturdy joints. 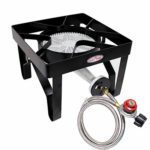 If you have a habit of being rough with your outdoor equipment this gas burner makes for a great buy. During our tests we found it to be nearly indestructible and yet still cooked like a champ. The burner itself is also made to excellent standards. Similar to the body, it is made from solid cast iron and is a very rugged design. The 79 individual nozzles are very well crafted and none were plugged upon arrival. Overall this is an excellent heavy-duty propane burner with high quality components that’ll see you through hurricanes, parties and endless backyard festivities. The Basecamp Single Burner Angle Iron Camping Stove comes with a solid 10.5” square cooking surface. This is perfect for medium sized pots or general outdoor cooking. While we still prefer the larger sizes of the Bayou Classic SP10, this is more than large enough for the job even if you have a huge pot of crawfish. This unit does come out on top when it comes to low profile design though. Standing at only 6” tall it is very close to the ground making it wonderfully stable and extremely resistant to tipping over. Plus, it lowers the amount of wind that can disrupt the burner. 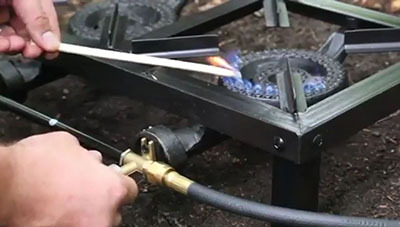 The legs are semi-adjustable as well which helps when you have uneven ground and makes this propane burner much safer to operate. The heavy duty cast iron burner measures in at 5.25” in diameter and is the perfect size for small and medium flames. The small size makes it a lot easier to clean and it also helps to reduce soot build up on pots and pans in case of an inefficient burn. For a simple heavy-duty propane burner, this unit is still packed with features and offers a great design. We loved how the angle iron design raises the pots a bit from the flames. This allows for increased airflow with promotes combustion and give you superb heat output. It does however make the gas burner a bit more prone to blowing out in the wind. Just keep that in mind if you’re planning to simmer with it as the small flame can easily be blown out. One of thing we were confused about was the lack of a propane hose and regulator assembly. This unit does not ship with one, which to us seems very strange. Instead you’ll have to pick up the Gas One 4FT High Pressure Propane Adjustable Regulator with 4ft Hose or something similar. The upside is you can choose a lower cost rubber hose like the one above, or go with a high quality braided stainless-steel hose. The choice is yours to make. Similar to our other top choices, the open design elements of this propane burner mean minimal cleanup, fast cooling and easy transport. Plus, it makes the unit very resistant to dropping as it is a fairly light weight burner and not prone to getting damaged. The specific design of this unit did cause the control knob to heat up while in use though. So, you may want to buy a pair of Extreme Heat Resistant Grill Gloves so as to not accidentally burn your fingers. In the end, this is a solid performer and a great choice for a propane burner. It has a heavy-duty design and ultra-rugged components. Plus, it’s very easy to use and great for simmering water over a low flame. While we wished it came with a hose and regulator it does allow for you to choose your preferred hose instead. 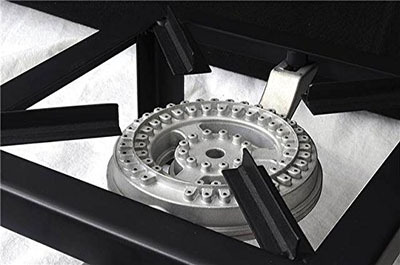 If you think you won’t need a large cooking area and instead prefer a smaller flame and durable design, go ahead and buy the Basecamp Single Burner Angle Iron Camping Stove, it makes for an excellent choice. Last up on our list is the stellar Dark Star Propane Burner 2.0. This 65,000 BTU burner is a strong contender and works great for boiling up some crabs, turkeys or wort. It has a tall ergonomic design and is perfect for larger pots with its incredibly large cooking surface. Topping it off the built-in windscreen does a great job of protecting the flame. This lightweight unit is great if you just want to quickly use it over the weekend and is a super easy to move. Even better, when compared to some of the other propane burners, it’s fairly low priced as well. It’s simply a great all-purpose gas burner. With such a durable steel design and a robust burner, the Dark Star Propane Stove is made from top notch materials. Based on our testing it easily held up to 125 pounds of oil and felt like it could hold a lot more. The round steel tubing makes for a great lightweight yet durable base and works wonderfully the anchor the unit together. Even more, the welds are all very clean and we didn’t see any pitting or imperfections. Based on our initial analysis this is a solid unit and can certainly stand up to rough handling. The included propane hose and regulator as also of fairly decent quality. While they aren’t quite braided stainless steel, they are still perfect for the job. 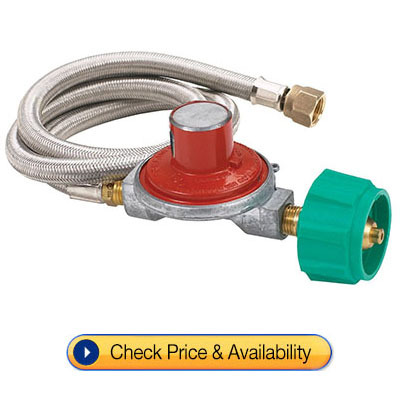 You can get very precise flame control with the adjustable regulator and the propane connection is leak free. Furthermore, the brass connections are high quality and built to last. The burner is also excellent with a dual ringed nozzle configuration. The nozzles were all free of debris and we didn’t notice any damage whatsoever. 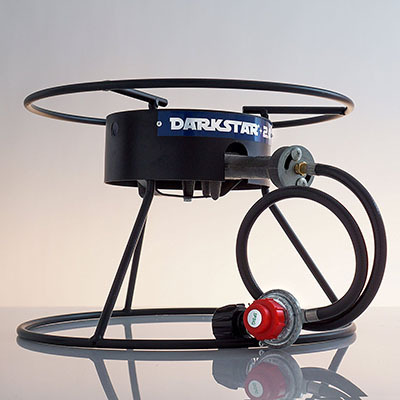 One of our favorite aspects of the Dark Star Propane Burner 2.0 is the incredible 17” diameter pot support. This is absolutely massive and perfect for those large crawfish boils when you need maximum space. Height wise, the unit stands at 13.5” tall, making it perfect for balancing bots while not getting in the way. We do wish it had individual legs instead of the circular base though. The single circle design tends to be a bit unsteady on grass or gravel. If you do decide to get this propane burner, we’d suggest you use it on a concrete patio or in the garage. Once positioned correctly however, the 17” diameter base is extremely stable as provides 360-degree support and is perfect for windy days. Speaking of wind, this unit comes standard with a 6” wind guard for those nasty wind gusts. In our tests it did a great job of protecting the flame and the height was pretty much spot on. From the 17” cooking area to the 65,000 BTU burner, the Dark Star 2.o is an all-around workhorse. We loved the minimalist design and the lightweight base. At only 14 pounds it was a snap to just throw in the back of our truck and hit the road. 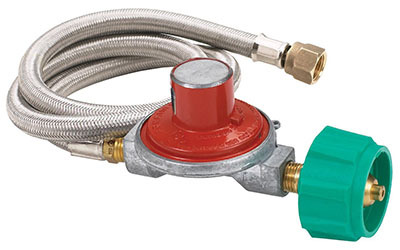 Plus, because it comes with the regulator assembly and propane hose, so there is no need to by extra components. As with most of our other top propane burners, this unit is extremely easy to set up and can be taken out of the box mere minutes before you plan on using it. Simply thread the propane hose on, position the burner and attach it to a propane tank. The high BTUs allowed us to boil water and oil extremely fast which is great for when you have a larger pot and a ton of guests. Nobody wants to be waiting for 2 hours for their crawfish. Just as a note, like most burners the interior paint will burn off during the first use. So, it’s a good idea to burn it off for a few minutes prior to putting your pot on it. As of now there is simply no paint that’ll hold up under such extreme heat. 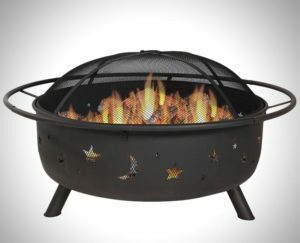 The Dark Star Propane Burner 2.0 is a great all-around propane burner and has some excellent features. We loved the built-in windscreen and the large cooking area. Coupled with the lightweight design, this is a great portable propane burner and is easily tossed in the trunk. It has got all the heat capacity you’d ever need and with quality components, is built to stand the test of time. Plus, at such a low price this is a great budget gas burner that won’t break the bank. You can buy the Dark Star Propane Burner 2.0 and rest assured that you’re getting a quality burner so you can focus on impressing your guests. We know there is a lot more to a propane burner than simply buying the right one. In this section we’ll cover topics such as propane burner maintenance, how to clean a propane burner, propane burner accessories and more. After reading this, you’ll be about as close to a propane burner master as you can get. While this may seem like a bit of an odd question, there is a good reason behind it. After all, almost all cooking can be done on an outdoor grill, fire pit or inside your kitchen. However, there are certain instances when a propane burner is simply the right tool for the job. Imagine being able to fry entire turkeys, chickens or crabs without the mess. That means no cleanup, no smoke and no burning oil flying over your kitchen. An outdoor propane burner is the perfect choice for deep oil frying. It’s able to get the oil up to the necessary temperature quickly and safely, while still providing heat control and a stable working surface. Because propane burners are used outdoors, any oil that does escape doesn’t need to be cleaned up. For people who hate cleaning (like us) that’s a huge plus. Even better, the smoke simply dissipates into the sky. We hate having to keep our doors open for hours on end to get rid of the smoke after pan frying a single steak. Whatever it is your frying, an outdoor gas burner can make it a hell of a lot easier. While smoking meat is technically possible indoors, it is far from the best method. With a reliable propane burner, you can quickly heat up a pan to red hot, throw in some wet wood chips and smoke away. The smoke is free to escape and won’t stain your walls, or cause all of your smoke alarms to go off. Plus, the high heat is great for true smoking and imparts a wonderful flavor to the meat which you just don’t get at lower temperatures. While a smoker grill combo is best for this task, a high-quality propane burner works just as well, and takes up a lot less space. Frankly, if you’re trying to have a real crawfish boil, you absolutely need a propane burner. With such large volumes of water, a conventional stove will take forever to bring it to a boil. While a nice 30,000 BTU gas burner will have it ready to go in 30-40 minutes flat. Just enough time to finish off a beer or two and get your crawfish seasoning out. Plus the large 15”+ diameter burners are great for balancing large pots and are actually much safer to work with. This is one case of having the right tool for the job is necessary. Similar to outdoor frying, the cleanup will also be much easier. You can simply dump out the leftover water on the ground and spray off your pot. Additionally, the outdoor burners cool off very quickly and can easily be packed up and stored for your next event. 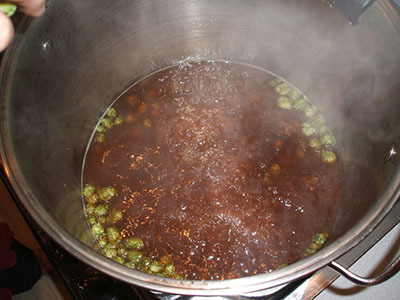 Any good homebrewer knows that boiling your wort is a critical step in the brewing process. Typically, we see 5-10-gallon batches as being fairly common and something you’ll definitely run into. But let us tell you, that’s a lot of water to boil on your home stove. If you like waiting hours for the water to boil and don’t mind breaking your stove, more power to you. We however, enjoy the speed, efficiency and easy cleanup of a propane burner. Just stick one on your back patio or garage and you’re good to go. A gas burner like the Bayou Classic SP10 is a perfect choice for brewing as it has the power, low price tag and is extremely reliable. A propane burner is a fairly simple device, however there are a few things to keep in mind in order to stay safe while using one. Whether you’re prepping for a crawfish boil or getting ready to brew a batch of beer, make sure you don’t use your gas burner inside. Burning propane produces odorless toxic carbon monoxide gas that can really ruin your day. Make sure to set up your outdoor burner in a garage, driveway, patio or any other exterior space. This allows the carbon monoxide to safely vent away and keeps you safe so you can enjoy your guests and the food. Another piece of advice that we commonly see ignored is keep your flame adjusted correctly. The flame should just reach the edge of your pot, and shouldn’t be spilling over. This prevents excess scorching and allows you to more efficiently use your propane. Plus, it helps to prevent accidentally setting nearby items on fire. This leads directly into our next safety tip which is, remove flammable items from around your propane burner. There is nothing worse than seeing flames and smoke billowing up from around your turkey. At least if you followed our first tip you’ll have it outside, but even so, it’s best to play it safe. Keep all coolers, plates and accessories at least 3 feet away to avoid any accidents. Next up is something that is probably common sense, but we’d like to mention it anyway. Be sure to set up your propane burner on stable and level ground. The last thing you want to have happen is your beautiful fried turkey turning into a tsunami of burning oil rolling over the yard. If you can, setting up your gas burner on a concrete slab is a great way to make sure it’s safe and sound. Last up on our safety tips is to check for leaks and fix them. We can’t tell you how many people let propane seep out of their hose and do nothing about it. If it’s hissing like crazy and you smell rotten eggs, it’s probably time to replace your propane hose and stop cooking until you do. It’s a quick fix and one that could save you a whole bunch of trouble down the road. Setting up a propane burner is a fairly simple process overall and can be summarized in the below 5 steps. Place your propane burner on clear, level ground away from flammable objects. Take your propane burner and connect the propane hose to the base unit. The hose typically has threaded connections. You should make it hand tight plus a half turn more for the best seal. When you’re ready to light the outdoor burner place a lit lighter over the propane nozzle and slowly open the propane tank valve. You’ll hear a slight hiss and after a second or two flames should appear. If they don’t, turn off the tank and repeat the process, but don’t open the valve fully until it’s lit as it may cause a huge fireball as the gas accumulates. If you don’t feel like reading you can also watch the below video which shows how to set up a propane burner from start to finish. After a long day of cooking the last thing you’ll want to do is clean your propane burner. However, it only takes a few minutes and really helps to increase the lifespan of the unit. Plus, you’ll feel accomplished after you finish, at least we did. The first thing you’ll want to do is disconnect the gas tank for the propane burner. This ensures you won’t accidentally leak any gas while you’re cleaning. You can also unscrew the propane hose from the base unit and quickly wipe it off with a cloth if there is any residual oil or dirt on it. For the burner itself we tend to just take a wire brush to it and scrub like mad to get rid of any burnt-on chunks or bits of carbon that formed. Afterwards usually take an abrasive cleaner and a sponge to get into all the cracks and get it squeaky clean. Unless you spill syrup all over it, you should have it clean in under a few minutes. 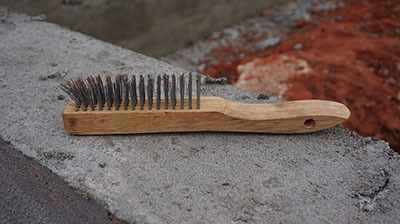 If you did, you can try a wire brush drill attachment to really do the heavy lifting. Drying it off is as easy as leaving it in the sun or quickly blowing it off with an air compressor. You don’t want to leave any water on it as it can cause rusting and make the connection a bit harder to fully seal the next time around. That’s basically it though, there isn’t much to it and it’s a pretty fast process. Maintenance wise there isn’t a whole lot you need to do for a typical propane burner. However, there are a few techniques to keep your flame burning hot and strong. Over time the burner can have oil, grease and carbon cake up on the inside. A quick cleaning with a toothbrush will get rid of most external residue. For any internal gunk clogging up the nozzles, you can use a paperclip or a needle to get a deep clean. Simply run the needed in and out of the propane burner nozzles to clear them out. Make sure to shake off the burner or blow it off with compressed air afterwards. If you don’t, that old residue can re-collect back at the nozzles and you’ll be back to square one. If for some reason your burner is beyond cleaning or gets damaged you can easily replace it as shown in the below video. You’ll also want to routinely take off the propane hose connection and clean the threads, overtime the metal can expand and contract leading to dangerous leaks. A mild cleaning solution and a toothbrush are your you best friends here as they can clean deep into the threads. Keeping your gas connections looking like new will go a long way to increasing the life of your propane burner. That last tip in regards to maintenance is to ensure that all screws and connections are tight. Over time the cycle of heating and cooling can cause screws and bolts to loosen on your outdoor burner. Every few months it’s a good idea to go ahead and tighten them. They only need to be hand tight, so don’t go overboard. This will keep your cooking burner stable and ready for when you use it next. One of the best things about propane burners is the sheer usefulness of the things. From frying, to smoking and boiling you can do a whole lot with a single unit. You will however need the proper accessories for the job. We’ve compiled the below list which covers most of the accessories you’d want. Keep in mind, they are pretty task specific, so you may need a few to cover all your bases. So, if you’re like most people, chances are you’re either frying a turkey or making some crawfish with your new propane burner. 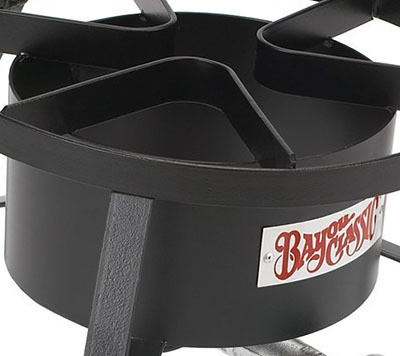 For the first option you’ll need a durable turkey fryer pot. There is simply none better than Bayou Classic 3025 30-Quart Aluminum Turkey Fryer Pot as it comes standard with all of the freebies that you could ever want. If you’re looking for a bit of a lower cost option, the King Kooker 30PKSP 30-Quart Aluminum Stock Pot is also a great option. The 30-quart capacity is more than enough for even the largest of turkeys and the included turkey rack makes taking out your bird a snap. Plus, we loved the spigot for easy draining and cleanup, something the Bayou Classic 3025 lacks. A propane tank is another must have accessory for any new propane burner owner. Typically, a standard 20 lb. propane tank will work great. While it is possible to do a local tank exchange program at a grocery or hardware store, there is an issue. With tank exchanges, 99% of the time you’ll get an underfilled tank and while not a big deal it is something to be aware of. 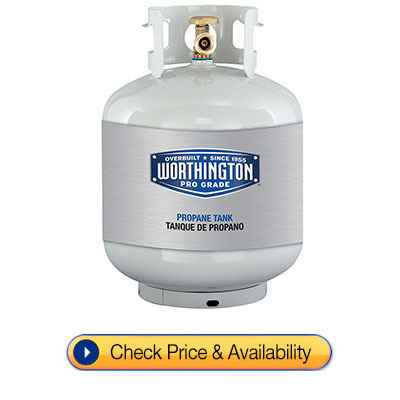 We recommend instead you grab something like the Worthington 303955 20-Pound Steel Propane Cylinder. This tank will last for years and can be filled at any local propane depot. Plus, it’ll cost you a lot less in the long run. Even better they weigh the tank each time it’s filled so you know you’ll be getting a topped off tank that’ll last for many crawfish boils to come. 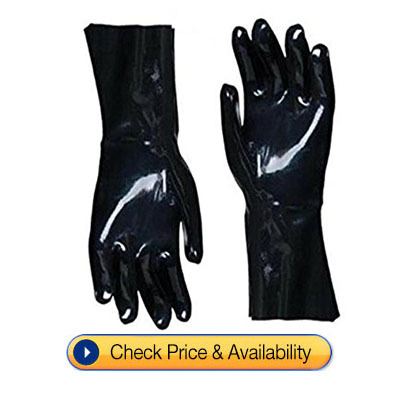 These are another great addition and provide some necessary protection against burning oil and hot metal. We’d recommend you grab a pair that has some extra-long arm coverage such as the Artisan Griller Insulated Gloves. These are perfect to put on when you’re taking out the turkey and can make a world of different. Using a folded-up towel to maneuver a hot pot is simply not the right way to go. Plus, these have added grip and help you keep a firm hold on lids, hoses and handles. If you want to keep your hand safe and make your life a lot easier a pair of insulated gloves will go a long way! Even better you can use them for traditional grilling and fire pits as well. 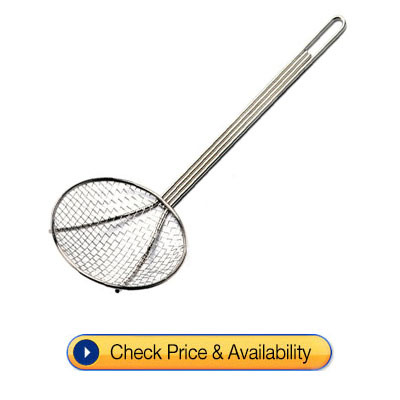 If you’re planning to do a lot of deep frying, you’ll definitely want a skimmer to easily flip food and get it out of the pot. The long handle lets you get anything that may have fallen to the bottom. Plus, it allows you to stay a bit farther away from boiling oil and the high heat of the propane burner. One of the better choices on the market is the Bayou Classic 0186, 18-in Nickel-Plated Skimmer. This is a very high-quality skimmer that is super easy to clean. Plus with the durable nickel plating it’ll last for year after year. 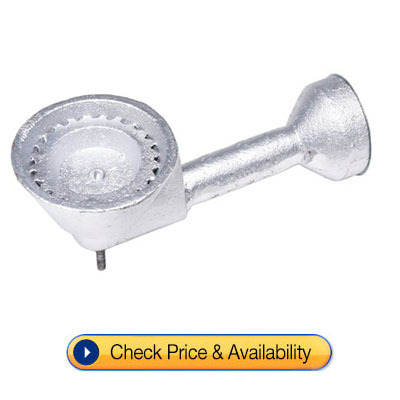 This is one of those buy it for life accessories and is a must have for any propane burner cookout. Even the most robust of propane burners eventually wears out, has an accident or gets dropped one too many times. The good news is replacement parts are readily available and fairly cheap. If like most people you’ll be getting a Bayou Classic SP10 propane burner, we’ve tailored this list accordingly so you can quickly find the SP10 replacement parts you need. The Bayou Classic Cast-Iron Replacement Burner comes in either 4”, 6” or 8” sizes and fits nearly any Bayou Classic model as well as a host of other propane burners. This is a high-pressure replacement burner and includes the rotating disk vent. The Bayou Classic M3HPH 36-Inch Stainless Braided Lpg Hose comes with the entire regulator valve assembly as well as a durable 36” long stainless steel braided propane hose. It is a perfect match for the Bayou Classic propane burners and the ⅜” flare swivel fitting is high quality and built to last. The Bayou Classic Brass Control Valve goes immediately downstream of the propane tank. Because it is a moving part, the control valve is more prone to failure than other components. 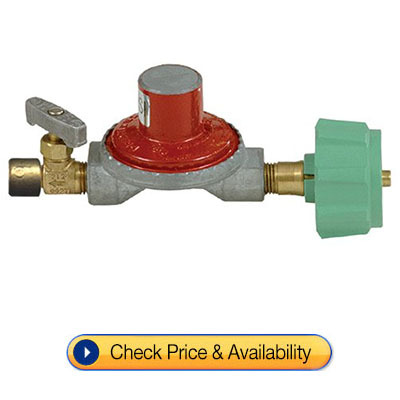 This is a durable brass replacement that has ¼” connections on each end and is designed for liquid propane gas. This is certainly one of the more critical pieces on any propane burner. If your stainless-steel hose is still in working condition you can instead opt for the Bayou Classic High Pressure Regulator/Control Valve. This includes the entire control valve and regulator assembly, including the teal propane tank connection. It’ll fit on your SP10 and SQ14 models as well as a few other brands. It’s a bit more cost effective since it doesn’t include the hose. Another one of the more critical components on a propane burner is the air shutter. Due to its small size it is easily lost in the grass or while traveling. Thankfully you can get the Bayou Classic Replacement Air Shutter as a standalone part to quickly replace it if it goes missing. Let us tell you, we have reviewed and researched a ton of different propane burners to make this article possible. We can strongly recommend that you buy the Bayou Classic SP10 as it is a great low-cost burner that works wonderfully. You can fry turkeys, boil crawfish and stir fry to your hearts content. If you’ve got a bit of a higher budget, buy the Edelmetall Brü Burner. It features stunning materials and simply top of the line in all regards. It is the best propane burner on the market but probably not the most cost-effective choice. In the end though, whichever burner you choose, stay safe and enjoy!